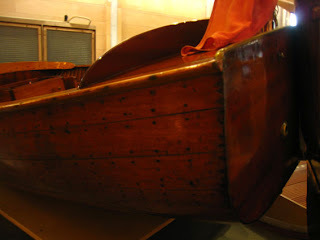 More from the Maritime Museum. Shocking photo - but more as a note to myself than anything else. She is Shush. A boat without a name (or at least without a name painted on her side - which is unusual in the boat world). Her owner, Morgan Giles (owner of the Morgan Giles boatyard in Teignmouth, Devon), used her as a tender out to his yacht. While he was building her, apparently he tried to keep her name secret and instead answered 'Shush' whenever he was asked. In the end the name just stuck. Nice sister post to this.